You are here: Home / News / The First Empire And The Last Dominion. The First Empire And The Last Dominion. The conservatism of MAAT reflected, and reinforced, the stability of ancient Egypt with its homogeneous population, fertile soil, stable weather, and static technology. The United States today has rapidly changing technologies, an ever more diverse populace and increasingly fickle weather. If that were not enough to insure unremitting change, the nation is solemnly pledged to form “a more perfect union” with “liberty and justice for all.” Despite these differences, however, both ancient Egypt and the US today can be seen as living under MAAT. Although Egypt seemed timeless, there was change, if ever so slowly. MAAT had always been implicit. But the disruption after the collapse of the Old Kingdom occasioned it to be spelled out in written form. The formal statement of MAAT served as the guide to reconstruct the political and social order during the Middle Kingdom. Afterwards, down through the centuries, MAAT would be modified in tune with the times. Thus, MAAT can be characterized as ancient Egyptian governments’ gradually evolving reason for being. Well, if all governments are equal, why then are some toppled by revolution? Because they failed to uphold MAAT, that is, to maintain balance among the competing forces bubbling up around them. Ancient Egypt appeared eminently stable because of its largely static conditions. In this fast changing world, governments today have a much harder task. Though all governments may be equal, the UN on occasion has sanctioned interventions. The United Nations can be seen, and is proclaimed, as the overarching government of humanity. It may appear weak depending, as it does, on the collective agreement of the major powers. But the UN is the world government that humanity wants since that is the one that humanity has. Today the US is the hegemon, the most powerful, influential nation on earth, by far, like Britain, Rome, Egypt and others in the past. “The first ‘world empire’ came about as a result of the conquests of the Pharaoh Thutmose III. . . a model that was to be reincarnated in the empire of Alexander the Great, the Roman Empire, and the empires of Charlemagne and Napoleon.” World Empire is something Hitler also attempted, and which the United States today, for all intents and purposes, has attained. 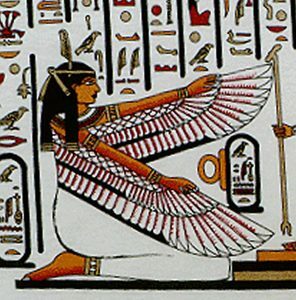 MAAT reflects and reinforces balance in the life of the individual, the state and nature. In the days of ancient Egypt, MAAT applied to Egypt and the lands under its dominion. Today, though, it is imperative in the world in its entirety, 250 nations, each individually striving to maintain harmony, while deeply interconnected. Can this be done? Yes, if the hegemon, the US, leads by example and finally fulfills its foundational promise of “liberty and justice for all.” But will it? Foolish question, failure is not an option, if, that is, humanity is to survive. . .